Trained Agripreneurs operating the fish smoking enterprise.Photo by IYA. The Youth-in-Agribusiness program has evolved, emphasizing the provision of training in agribusiness for youth, creation of jobs through the establishment of independent agribusinesses, expansion of the program to other locations in Africa, and recognition of the program through intense advocacy and impact. The mechanism toward agribusiness development is through the development of detailed business plans for investment and commercial loans. Several mentors assisted in this effort, particularly EKIMIKS in Nigeria. These plans were built upon six proven business models: seed production, cassava production and processing, fish production and processing, horticulture, advanced propagation systems, and value-added processing; but the youth were encouraged to explore other enterprise opportunities as well. This resulted in the establishment of some businesses outside the initial scope of the business plans. Businesses launched in June 2017 are related to poultry raising, snack production, seed production, fish processing, and cowpea and yam packaging. 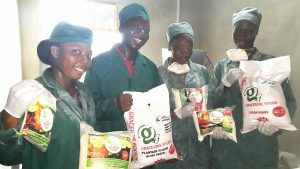 Frotchery Farms Limited: This business is located in Ibadan, Oyo State, Nigeria and owned by Babatunde Yusuf, Ngozi Chituru, and Hammed Oni, who were trained under the IITA Youth Agripreneurs incubation program. They specialize in the production of smoked fish using the smoking kiln technology. Developing a strong customer base, they have ‘‘grown’’ the product which is now available in supermarkets, restaurants, and hotels. 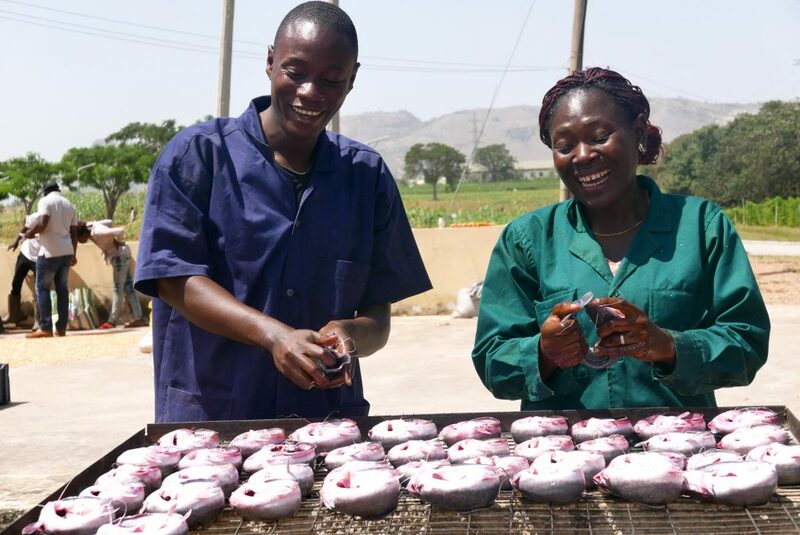 The business has achieved a revenue of N3,707,560 (about $10,300) and processed over 4.5 tons of fresh catfish since start up while developing strategies to increase the existing market. Frotchery Farms projects that it will process 36.6 tons of fresh catfish resulting in average monthly sales of 2–4 million naira ($5555-11,500) and create direct employment for at least two additional youth in 2018. Gracevine Foods: The business is owned and managed by Idowu Abosede, a young lady who studied Animal Breeding and Genetics at the Federal University of Agriculture, Abeokuta (FUNAAB), Ogun State, Nigeria. Located in Ibadan, Nigeria, Gracevine adds value to agricultural produce by processing and marketing products such as clean stoneless cowpea, cowpea flour, yam flour, and plantain flour. The business has three young employees. This enterprise conducts business in Niger State and maintains another distribution office in Ibadan, Oyo State. Since existence, the business has produced 3.5 tons of its products with a generated revenue of N774,030 ($2,150) and a 23.4% profit. Furthermore, in 2018 the business is projecting a 25% increase in production totaling 12.25 tons of products and revenue of N2,400,000 ($6,667) with at least three additional distribution channels. 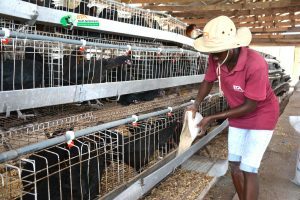 TopNotch Poultry: TopNotch Poultry is a small-scale, commercial feed-to-fork, broiler enterprise owned and managed by Yetunde Oginni and Ibukun Agbotoba. It aims to establish a reference-farm with feed milling, breeding, incubating/hatching, processing, and retail/food units for research, training, and demonstration in best-fit technologies and practices suitable for youth businesses. In addition to fresh broilers, TopNotch also provides smoked, grilled, and fried chicken. The business started with a loan of $14,000 and grew with a weekly processing of 500 birds, an annual revenue of $90,000, and $14,000 net profit. The demand for their product has grown and they are projecting a weekly processing of 1,000 birds, an annual revenue of $200,000, and a net profit of $40,000. A local investor invested some funds in the operation of the business. TAC Farms: This is owned by Mustapha Quadri, a graduate of Botany from Ahmadu Bello University. TAC Farms produces improved maize and soybean grain for poultry farmers as raw material for feed formulation and oil processing industries that use soybean as a raw material. TAC Farms has 13 hectares of field in Zaria with an office located at Challenge, Ibadan, Oyo State. Since its establishment in 2017, TAC has harvested 28 tons of maize, but faced the challenge of floods, which destroyed about 2 hectares of the field. The business has access to improved crop varieties developed by IITA. Similar efforts are under way in Kenya where eight business plans involving 11 youth seeking $340,000 are under development. In DRC, eight agribusiness plans are being finalized requiring about $1.7 million in loans and a projected revenue of $7.8 million. Fish cages, poultry, and mushroom production were launched in April 2017 and additional business plan development is ongoing. The young CEOs mentioned above were supported by IITA through the provision of start-up funds, improved planting materials, a series of entrepreneurial, business management, and leadership training,mentoring, and backstopping. IITA’s Business Incubation Platform (BIP) employed several Agripreneurs in 2011 as key account managers for IITA technologies like Aflasafe, Nodumax, and GoSeed while an additional five youth were employed as enterprise leads to run cassava, maize, plantain, vegetable, and fish businesses with the transfer of the enterprises to BIP. Similarly, the five-year project funded by the MasterCard Foundation and awarded by Michigan State University was officially launched in 2017. The project, known as Agri-Food Youth Opportunity Laboratory (AgYouthlab), is targeted towards expanding youth employment opportunities in the agrifood systems of Nigeria and Tanzania. This program aims to train 16,250 out-of-school, disadvantaged youth within the age range of 18–24 in Nigeria and Tanzania along the value chains of cassava, poultry, oilseeds, horticulture, and aquaculture. This project provided full-time employment for six agripreneurs in Nigeria and Tanzania. During early 2017, IYA moved to Imo State to establish an incubation center where young people in the southeastern part of Nigeria can be trained and equipped with agribusiness skills. The incubation center served as a model for gainfully employing young people in the state along the agricultural value chain. It provided an opportunity for IYA to extend its tentacles and fulfil its vision of ensuring that youth in all the geopolitical zones in Nigeria tap into the benefits available in agriculture to enhance food production. To show its support for the IYA program, the state government released some abandoned facilities—fish ponds, poultry, and greenhouse at the Imo State Polytechnic Umuagwo and at the Anambra-Imo River Basin Development Authority in Agbala to IITA for use in the incubation program. IITA deployed six experienced Agripreneurs from Ibadan and Abuja to renovate and resuscitate the facilities and display the viability of the horticulture, fish, and poultry enterprises. Stakeholders at the official launching of the AgYouthlab Project. Photo by IYA. The unit hosted the first-ever African Youth Agripreneurs Forum sponsored by the African Development Bank in IITA Ibadan. The conference, which was attended by over 300 young agripreneurs from all over Africa, gave them an opportunity to network and pitch their business ideas for funding. Year 2017 also witnessed the commissioning of Africa’s first Agripreneurs building at the IITA headquarters. The building is now called the A.A.A Agripreneurs building after the President of the African Development Bank, Dr Akinwumi Adesina. The building houses offices, seminar rooms, boardrooms, and other facilities. The commissioning was attended by the former Presidents of Nigeria, Chief Olusegun Obasanjo and General Yakubu Gowon. The IKYA DRC team increased the production of cassava flour to an average of 16 tons per month. This activity is conducted in conjunction with Community-based Cassava Processing Centers (CCPC) established through other IITA projects where IKYA serves as a trainer and marketer of flour as well. Two factors limited the group’s flour production: the supply of fresh cassava from outgrowers, and the rate of drying through an open-air system. To increase the supply of cassava, IKYA has linked with 14 youth groups engaged in cassava production and installed a locally made solar dryer at each CCPC. Drying will be accelerated through the purchase of a flash drier. Two large abandoned fish pond networks were discovered at Myakabere and Lwiro and are being modernized to produce catfish. To reduce costs the group produces its own feed from locally sourced ingredients. IKYA also operates a commercial bakery in Bukavu town where cassava- and protein-enriched breads are produced. The unit also recorded progress with some of its projects. The Community Youth in Agribusiness Group (CYAG) project sponsored by Chevron Nigeria Limited engaged 147 beneficiaries in the host community with independent businesses spinning off after the first phase of the training. IYA’s Building on the successes of the first phase of the training with negotiations ongoing for the flag-off of the second phase of the project. After successfully training young adults on the business of owning and managing a fleet of smart tractors, The Hello Tractor Project sponsored by USAID in 2017 registered a cooperative society of smart tractor owners and operators to promote mechanization, improve farm efficiency, and bridge the gap between the booking and hiring services offered by the owners and operators to farmers especially in Oyo, Ondo, and the Epe axis of Lagos State. The ENABLE Youth Program, one of the prominent projects under the unit, also commenced in Sudan and Madagascar in 2017. The ENABLE-Youth project in Sudan became fully operational with the appointment of a program coordinator and the establishment of nine incubation centers in five states. The project in Madagascar was also approved as a Project Preparation Facility (PPF). Other countries—Cameroon, DRC, Ghana, Kenya, Nigeria, and Senegal—will start soon. For 2018, IYA has a focused vision for youth in agribusiness and sees its progress in terms of both short-term strategy and longer term targets. It is envisaged that IYA will provide leadership roles and services to Agripreneurs across Africa, developing collaborative programs that advance youth agribusiness skills, and improve both agribusiness opportunities and the creditworthiness of youth entrepreneurs. Services provided will include advocacy, fund raising, communication, and training. Agribusiness incubations will no longer be based within the IITA HQ in Ibadan. Pilot enterprises will be positioned in various locations with technical and logistical backstopping. 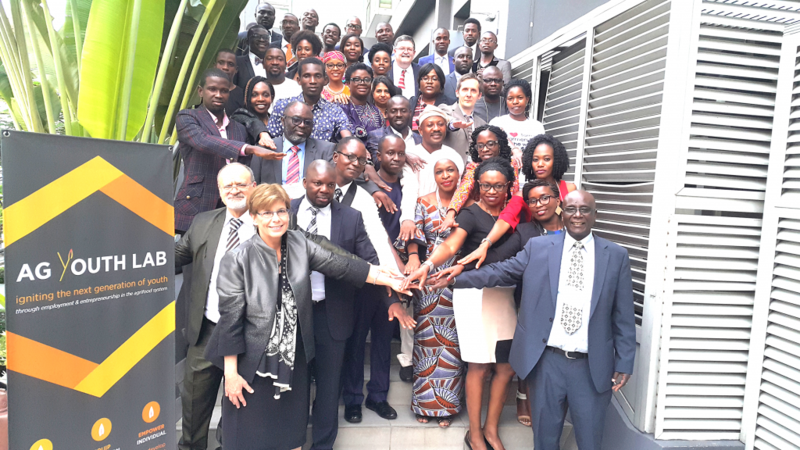 The AfDB ENABLE Youth Program has started slowly, but ultimately will provide loans to member countries towards developing national youth agribusiness programs in partnership with IITA. Many of the principles pioneered by the Agripreneurs will become incorporated into the curricula of universities and vocational schools. The positive examples set by young entrepreneurs will prompt commercial lenders to establish youth business programs and the public and private sectors to establish Youth Agribusiness Parks. Agribusinesses intended to provide self-employment for their founders will grow and provide decent jobs for other youth within a transforming agricultural sector.